The Israel Ministry of Foreign Affairs in Toronto announced that they would like to congratulate Dr. Uri Ilan from Hadassah Hospital on presenting at the World Association for Disaster and Emergence Medicine conference in Toronto. 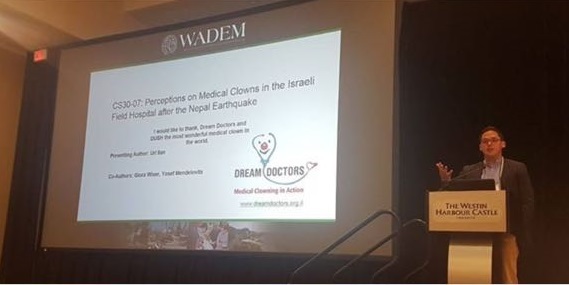 Dr. Ilan’s study showed the importance of having Dream Doctor’s medical clowns as part of the IDF Field hospital team that responded to the earthquake in Nepal. As you can see in the photo below, Dr. Ilan did not forget to thank his favorite Dream Doctor David “DuSh” Barashi from Hadassah!